Sometimes we are not paying enough attention to notice the people in our lives on a day to day basis. As a result we overlook those people who may potentially have a huge impact on our lives. I believe everyone lives a life that makes a difference and has importance. We may notice the same people everyday on the commute to work, at the store as we buy our food, or in our neighborhoods as we take an evening walk. What we may not always notice are the lives they have lived and how they can influence us in powerful and profound ways. Everyday people have grand stories to tell if we are paying attention and willing to listen. For me it is a memory of a very old man I saw on my paper route everyday when I was a child. Every day I would walk my route delivering the newspapers. One day I had to start delivering to a new customer. The funny thing was there was no house on the plot of land where the newspaper-box was posted. Yet, as I started to deliver the paper, the newspaper from the day before was gone. So everyday I kept delivering the paper to that box. Then one day I noticed a section of the yard had been cleared. Then a few days later there was concrete poured into sections for what would soon be a home. Finally one day I noticed what seemed like a very old man walking slowing, moving things around and, getting things ready. I often look back on the one and only true interaction we shared. I am not sure why he did not leave the payment in the box that one month when I was a young boy. But I had to go ask him for his monthly payment as I did every month with all my other customers. It felt weird to me to enter his house upon his request because the walls were not built and there was barely a roof. As I looked around I noticed a wood burning stove and a small sleeping mat on the ground. I was stunned to think he slept here at night. That stunned shift in my thinking inspired me to ask him a question. And considering how long it took him to find his wallet as I entered, I think he wanted me to ask a question. He then answered my questions with a soft tone of sincerity and shared with me a small part of his story. 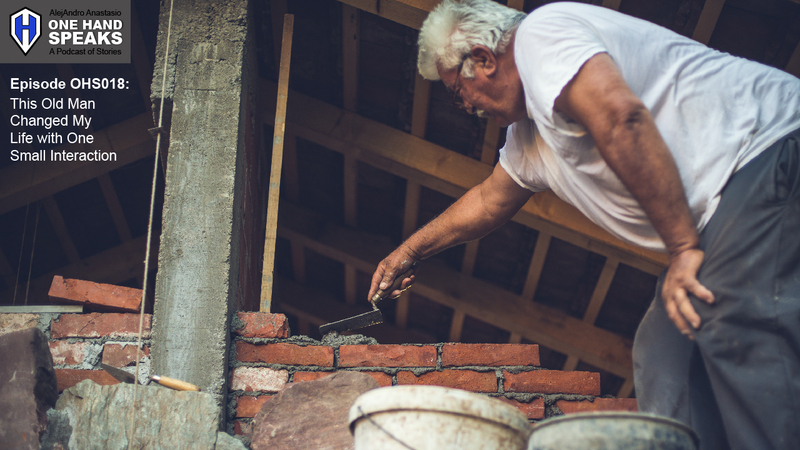 This podcast shares the story of meeting the old man who built that house one brick at a time. And with one brick at a time, in my memory of watching him everyday and speaking with him once, he made a profound impact on me and slowly changed my life. Delivering news papers as a child was my first real job. Winter in South Bend, Indiana was cold and filled with snow. But this old man filled my heart with warmth. One brick at a time – A 1946 film on how to build a brick house.